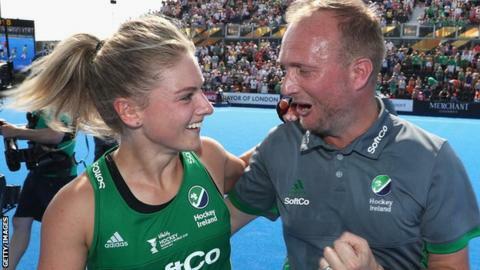 Graham Shaw has resigned as coach of the World Cup silver medal-winning Ireland women's team to take charge of New Zealand. Shaw was assistant to Darren Smith before being appointed head coach of Ireland in 2015. He guided the Irish to last summer's silver medal in London and a move from 16th to eighth in the world. "It was an honour to coach my country - we've had incredible times together that I'll never forget," said Shaw. Shaw joins world number six side New Zealand, who compete in the Pro League and have their sights firmly set on Tokyo 2020. He added: "I have worked with an outstanding staff over many years - your professionalism, honesty and friendship will stay with me forever. Why is Ireland's hockey silver such a big deal? "To the players I would like to say a massive thank you - your drive, dedication and loyalty has been relentless and it has been an absolute pleasure to lead the program over the past four years. "I would like to wish the squad all the best for the future. I hope you continue on this journey, inspiring the next generation of hockey players in Ireland and I hope to see you in Tokyo." Ireland captain Katie Mullan hailed the influence of Shaw over the past four years. "On behalf of the Green Army I would like to thank Graham for all that he has given to our team," she said. "He led us to a moment none of us will ever forget at the World Cup and the Blacksticks are very lucky to have him, we wish him all the best with this new adventure."